There are obvious ways you can use SmartThings to automate your holidays, but there are also some fun and easy ways to make it fun for the kids too. For example, there will be a nice surprise for the first of my children to bolt toward the stairs on Christmas morning. My goal was to play an mp3 that I made by mixing some sleigh bell sounds with a Santa Claus "ho, ho, ho" from a speaker located in the same room as my fireplace (and the Christmas tree). The speaker is a Sonos Playbar (Sonos speakers get up to a $50 credit on Amazon right now!) that has been added as a thing to my SmartThings hub but any connected speaker will work. The first thing I did was find the sound effect that I was looking for and dubbed over the extra "ho, ho, ho". I dropped the finished mp3 into my music folder so that it would show up in the Sonos app. 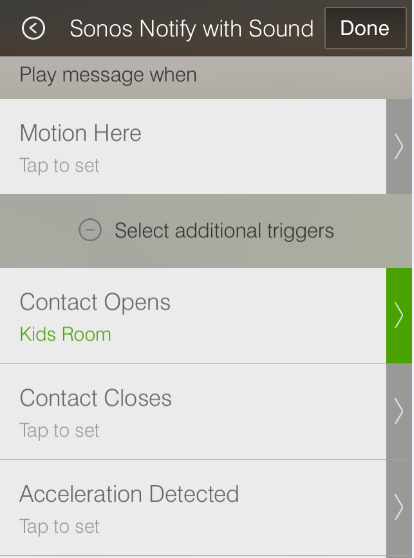 Next I paired a door sensor (the one on the recommendations page) with SmartThings and placed it on the kids' door. 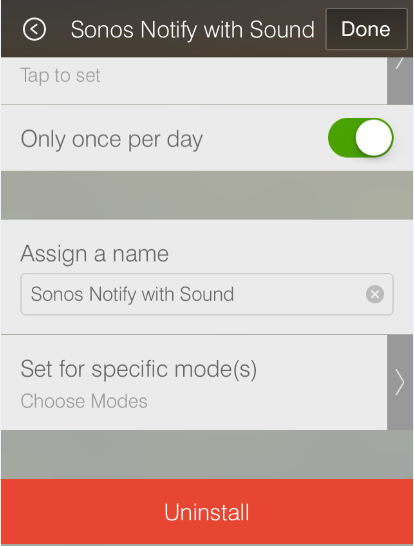 I already had the "Sonos Notify with Sound" SmartApp installed so I just needed to configure it. There are lots of options for how to trigger the sound or text, and a motion sensor would probably work better for most people. I chose the "Contact Opens" to use my door sensor. Now we just need to select the speaker we want to play it on and click "More options" to select "Or play this music or radio station"
You could create a "Christmas Day" mode and set it to only play then. 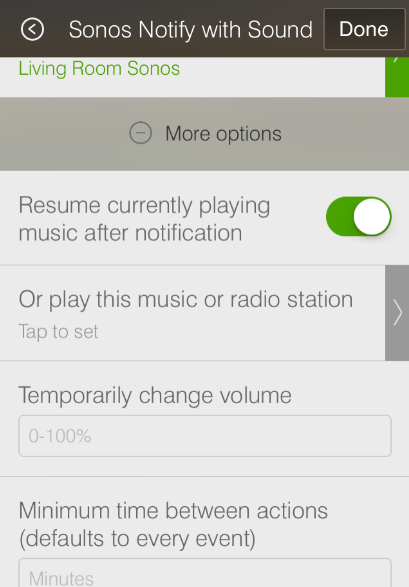 You could also specify that it only be played once per day to ensure that it doesn't play a second time. That was really easy! For added dramatics, I am going to have the room light turn off and three hue bulbs glow red and green briefly. It should all be over before they can get down the stairs. I will let you know how it goes. Maybe I will be able to capture it all on the Dropcam. 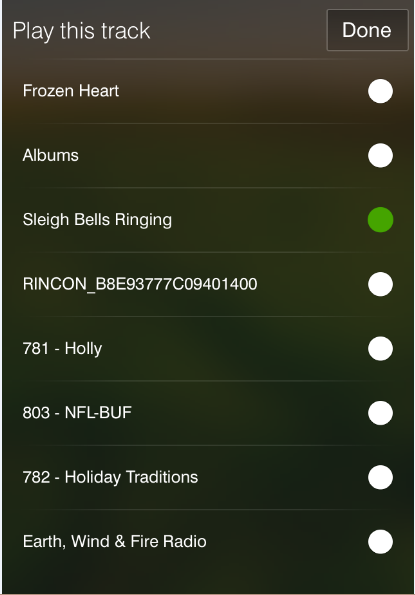 How are you using home automation this holiday season?